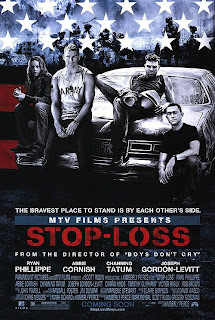 Stop-Loss begins with an intense scene of young American soldiers under siege by a group of insurgents. Gunfire, blood, mayhem--but not the usual "oh it's fake movie blood" type of scene. It's gritty and gruesome and "I can't look" all too real. Later, back home in Brazos, Texas, one of the soldiers is relating the story of this incident to friends and family, only to be given a look to hush because it's not the sort of thing people want to hear. Therein lies part of the problem with Kimberly Peirce's follow-up to Boys Don't Cry. Both films deal with troubling issues that force an examination of ourselves and our society. But, like the soldier's story in the movie, we don't want to hear it. Despite the attractive young cast and rock music soundtrack, Stop-Loss has only managed to make about $8 million since it opened a little over a week ago. People would much rather see a slick blackjack caper than deal with the realities of what the war in Iraq has cost us. Peirce unblinkingly depicts that cost--not just in the lives lost, but in the broken relationships and broken minds of the battle weary warriors. Forty years ago, there were protests and marches and speeches and songs--all to speak up and speak out about a war we shouldn't be fighting. But there was a draft back in the 60s, whereas today we have a "volunteer" army. But as Michael Moore stripped the facade away from the concept of a volunteer army in his documentary Fahrenheit 9/11 by showing how the army targets and recruits the disenfranchised in economically distressed areas, Peirce shows us another facet of the fallacy: the volunteer whose discharged is delayed or "stop-lossed." Ryan Phillipe played Brandon King, a young man who volunteered and served with distinction. But as he is going through the process of being discharged, he is told that he is to report for another tour of duty. The film follows Brandon's struggle and disillusionment as, no longer wanting to fight the war, he attempts to fight his fate. Channing Tatum and Joseph Gordon-Levitt offer two outstanding supporting performances, but are sadly underutilized. Unfortunately, the film starts out showing the bond between the trio but soon focuses pretty exclusively on Brandon's story to the detriment (in my opinion) of the film as a whole. Abbie Cornish (looking like a young Charlize Theron) rounds out the cast as Tatum's long-suffering fiancee, Michelle, upset with his decision to re-enlist. The portrayal of the camaraderie, the bonds of friendship and family and small town life are captured eloquently in the film. Stop-Loss is at its best when it shows us snippets of realism--such as a dejected Tommy Burgess (Joseph Gordon-Levitt) contemplating the aftermath of using the wedding gifts from his now broken marriage as objects for target practice. It falters when it rants and preaches with Brandon (Ryan Phillipe) at times railing in political monologues. Another example: Brandon goes to visit one of his men who was wounded in the beginning battle scene. It is powerful and touching as Peirce juxtaposes the cocky, handsome face of the young man before his injuries to the disfigured and maimed aftermath. But even more powerful, without the heavy-handedness, was the scene of Michelle (Abbie Cornish) playing pool with another patient who sports two prosthetic legs and a prosthetic arm. Stop-Loss examines one of issues associated with the war--the fact that while maybe not as many soldiers are dying, this is because medical advances are allowing acutely wounded soldiers to survive, only to be saddled with severely debilitating injuries for the rest of their lives. And sadly, the country and the government is not doing enough to support them as they struggle to make a living and have a life after serving their country. The film doesn't deal too much with that issue, but that's another movie in itself. The biggest issue that Stop-Loss highlights is that this war is being fought by soldiers barely old enough to be of legal drinking age--and yet they are old enough to be sent to die. It's tragic that so many young lives are being lost while old, white politicians (see Bush, Cheney, McCain, etc.) sanctimoniously preach about patriotism. Really? I don't see Jenna or Barbara Bush wearing slinging a rifle and Meghan McCain ain't trading her Manolos in for fatigues and army boots. Stop-Loss falls short of being a great war movie, ala The Deer Hunter or Coming Home, but it does overcome the philosophical in favor of the personal. It succeeds in both railing against the war and its destruction and at the same time positively and humanely portraying the brave young people who fight it.